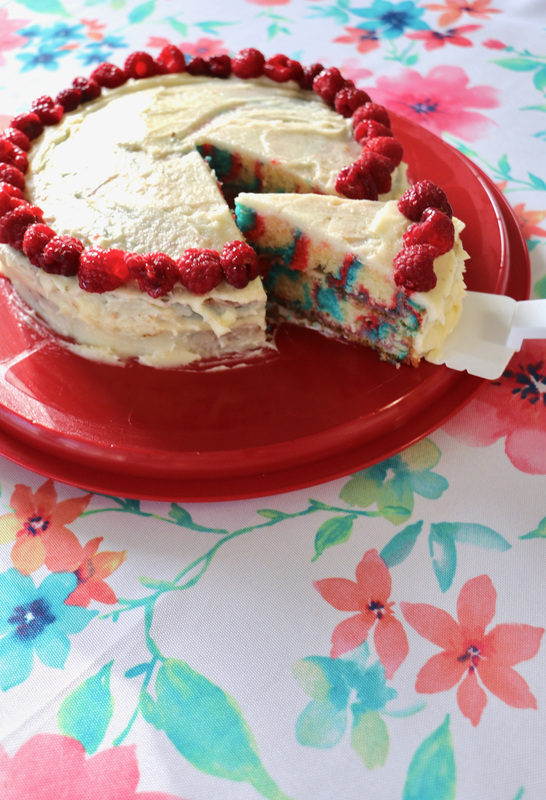 Fun & Easy Recipe: How I Made a Patriotic Tie-Dye Cake! 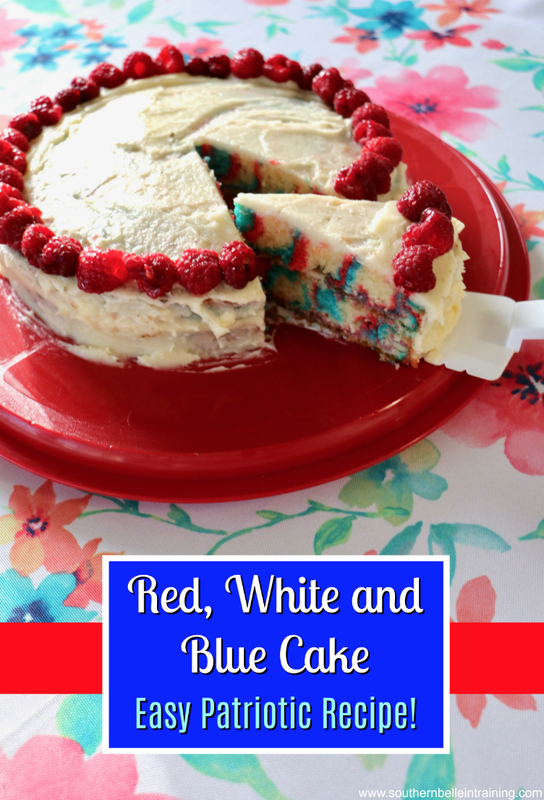 To preface today's post, I realize I am posting a patriotic recipe at an interesting time of the summer! 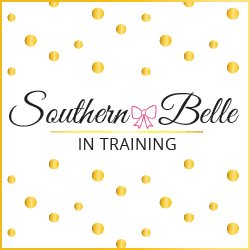 I meant to get this blog post up much closer to the 4th of July, but hey- better late than never right? I personally thing we should all enjoy showing our patriotic pride at all times of the year... July or not! 😉I also thought this recipe might make a tasty Labor Day Weekend treat- so you might want to save this recipe if you'll be entertaining that weekend. I've always loved the idea of doing themed holiday baking for different holidays around the year, but due to being in school for many of the past few years, and then having a crazy work schedule after moving to Vermont from 2017-2018 for my first job, I haven't been able to plan to celebrate all holidays as much as I'd like. Now that life is settling down in Virginia, I'm already thinking about how I'll be celebrating the big holidays later this year! Anyways, I was in town for July 4th this year, and thought it would be fun to celebrate by trying out different patriotic recipes. There are tons to choose from on Pinterest! The first thing that I made were red, white and blue cupcakes, which were kind of a fail (they turned out more pink, yellow and green!). I decided to try again though in my pursuit for a festive patriotic treat, and I had a WIN with this cake! I personally am not very into using cake mixes or pre-made frostings- the best cakes are ones that are made from scratch! I used this recipe to make the white cake batter- I liked it! Next, it was time to separate the cake batter into three separate bowls, and dye one bowl red and one bowl blue. FYI- this took more food coloring than I was expecting, so you might want to make sure that you have a lot! Then, I used this tutorial from Pinterest to make the cake look tie-dye. I was worried that the colors would bleed together and look weird since I'd previously had the patriotic cupcakes fail, but amazingly the colors stayed perfectly well using the tie-dye cake tutorial! After baking, I made a homemade white frosting using this recipe! I wanted to do something fun to decorate the cake without being "too much" (since the inside was so cool looking! 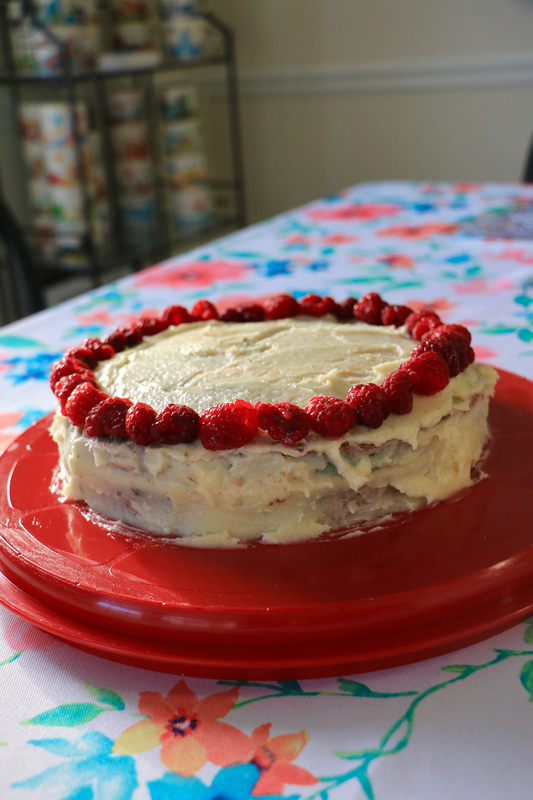 ), so I garnished the outside of it with sweet raspberries from my local farmers' market. And voila! This could also make a really fun Christmas cake if you substituted blue for green, and you could make it into an Easter cake as well with spring colors. It's like your own personal customizable Funfetti cake! Are you also a fan of doing seasonal baking for certain holidays? I haven't been able to do much Christmas specific baking in the last few years, but already excited to change that this year! How fun!! I love finding fun desserts to make!! 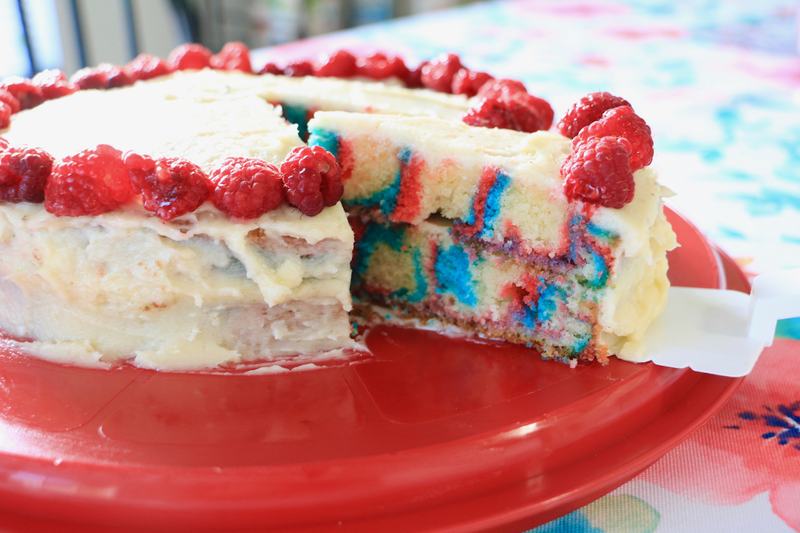 This cake is so cute and patriotic! I always love an excuse to try new recipes from Pinterest- a few years back I made layered cupcakes for the Fourth and they turned out so cute! YUM! This sounds amazing! It's soo cute too! Omg this looks so fun! I bet you could do the same things for other holidays by just switching up the colors! Def trying this for my best friend's birthday! oh my gosh this is so stinking cute! I would love to try making something like this. This cake is so cute! And I bet it tastes as good as it looks! Now I just want cake, haha! YUM YUM YUM! I need to pin this because my boys would love this. I love to bake and my kids love to eat, so I’ll definitely be trying this. What a fun cake! I've always wanted to try to make one with fun colors like this on the inside! The outside of the cake is so pretty but I love how the inside looks! This would be fun to do over the holidays, too! I’m getting married in a month, should I make a tie-dye cake as my wedding cake! Lol, would be much cheaper....and may taste better too! Yum this looks so good! There's nothing better than homemade frosting. I love the strawberries as a garnish! Ahh this looks amazing, and not too difficult to make! I love your idea of making a Christmas version of it too during the holidays! This looks like such a yummy recipe to make! I love trying new things out in the kitchen, so I'll have to take a stab at making this sometime. Making homemade frosting and decorating with fruit is the best!